Without guidance about how to find a sailing school, many prospective students may start with the least effective method: a Google search. They may make decisions based on cost, location, timing, and length of the courses. Let us share other important factors to consider and more targeted methods for sifting through the multiple options of sailing schools. American Sailing Association (ASA) or U.S. Sailing schools offer internationally recognized certification programs, allowing you flexibility in sail training and chartering locations. Each organization promotes “Outstanding Schools and Instructors” right on their websites. Ask yourself how “far” you’d like to go in your sailing. Would you eventually like to buy or charter a boat on your own? If so, choose a school that offers the full gamut of sailing certifications. Don’t select the sailing equivalent of a junior college if you’re after a master’s degree. Do the boats fit the course? Does the school have boats appropriate for the level of certification you’re trying to achieve? Many schools start initial training on small, tiller-steered keelboats, allowing you to get a feel for basic sailing skills and build confidence. For more advanced courses, progressively larger and more complex boats should be used. Will the school offer rentals or charters for practicing your newly learned skills on your own? Many schools do; some even have sailing clubs for cost-effective practice while meeting new sailing friends. Many schools offer customized sailing courses, including courses for women, couples, or families. 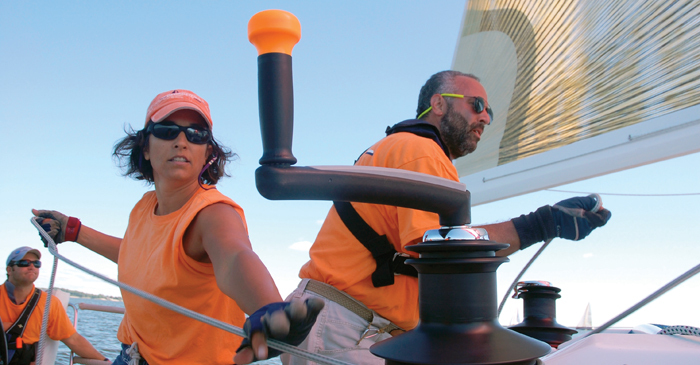 Tailored courses may also focus on specific skills such as docking, racing, or even just being a good crewmember. Through most good schools, you may hire an instructor for private instruction on your own boat. Dockside resources; availability of meals and lodging; size, type, and condition of boats; and safety and maintenance of boats. These items may be addressed by a personal visit to the school for a tour of the facility and boats and perhaps a demonstration sail. Top schools post instructor biographies on their websites and gladly introduce you to the teaching staff when you tour the facility in person. Are the instructors ASA and/or U.S. Sailing certified instructors? Do they have U.S. Coast Guard Masters licenses? Are they friendly, skilled listeners as well as “experts?” Would you enjoy spending a weekend with these instructors? Sailing schools are businesses, and if you hope to develop a relationship with one, be sure you’re comfortable with their style. Were your inquiries responded to promptly and courteously? Did the school provide the information you needed to make a fitting course selection? What sort of flexibility will you have for re-scheduling in the event of emergencies or foul weather? Ask for former student references. Sailing is an exciting and inspiring sport, and newcomers tend to have strong feelings about how they learned. If a school hesitates to provide happy customers’ contact information, there may be a reason for it. If a school does not have references for you, we recommend not writing the check.